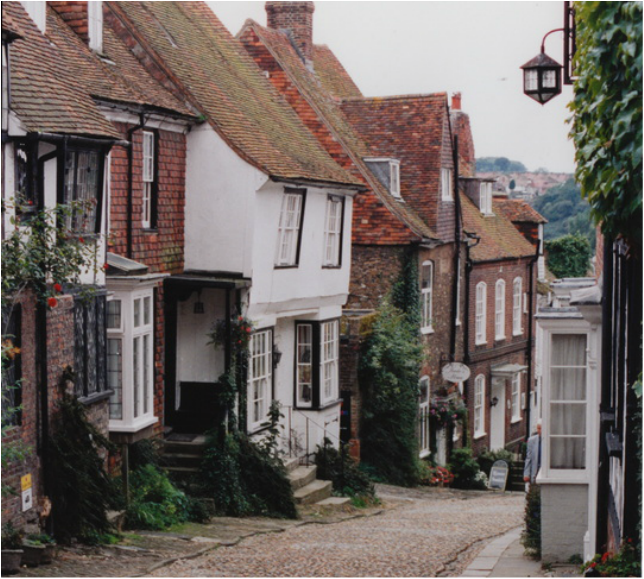 Rye is, in a word, enchanting. 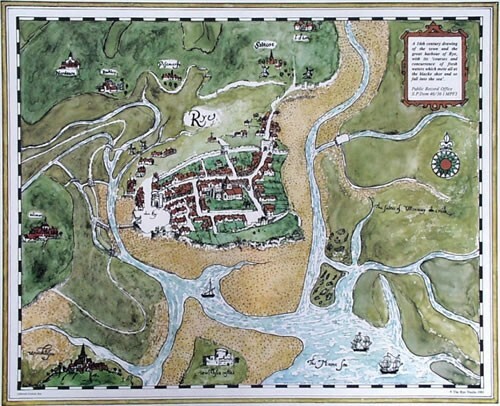 A medieval town in East Sussex, which is on the southern coast of England, Rye used to be a busy, important port—one of the largest and most important harbors in the country—until the sea went out and never came back in. Literally. It’s kind of hard to be a busy, important harbor when the sea is two miles out. This is a true story. One day Rye was a seaside town. Now it isn’t. One day there was a sea right there outside their door. Now there is farmland. 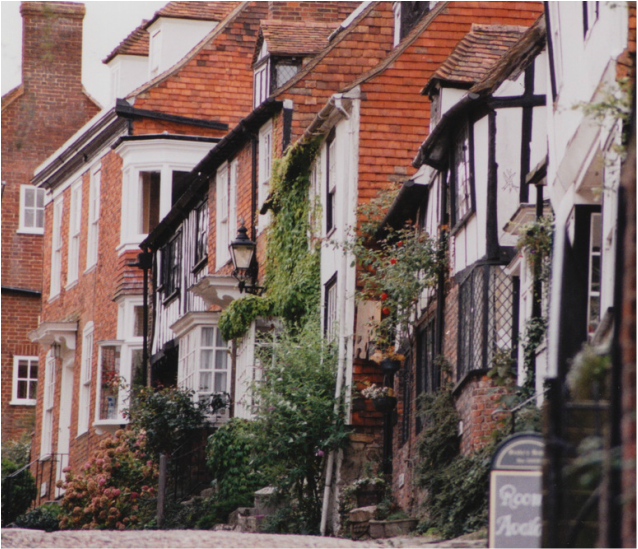 Mermaid Street was Rye's main thoroughfare in the 16th Century. It is stupendously and incredibly picturesque. Cobbled street. 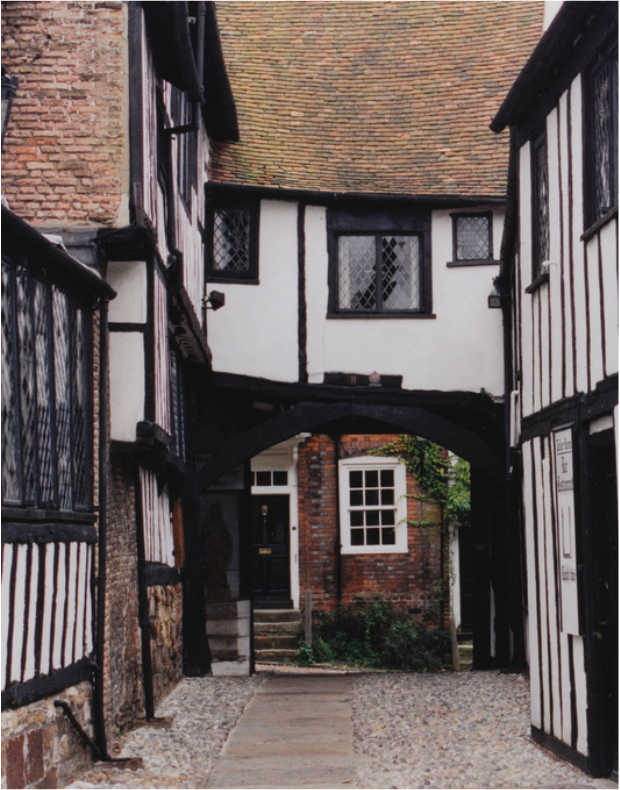 Ancient buildings from the 15th-17th centuries with strange names such as 'The House Opposite', 'The House with the Seat', 'The House with Two Front Doors', ‘Christmas Cottage’, ‘The First House’, ‘The Other House’, etc. It’s all part of the word “enchanting” I’ve already mentioned. Twice, now. The Mermaid Inn is one of the oldest inns in all of England. It’s located on Mermaid Street. Hence the name. It's a really ancient building with a really fascinating story. The cellar and foundations are Norman, probably dating from around 1156. The walls are built of wattle, daub, lath and plaster. In case you missed the Wattle and Daub lesson on another part of this site, here it is again. In 1377 the French paid yet another uninvited and unwelcome visit to Rye, and pretty much burned down anything not made of stone. This included the Mermaid Inn. Only the cellar survived. It is cut from rock. Rock does not burn. Keep that in mind if you want to construct a historic building in a town with a country that hates you just over the sea and keeps rowing over with lit torches. By 1420 or so, the building was rebuilt, and it’s pretty much been an inn since the 1600s. People in the know claim that Rye is the most haunted place in the United Kingdom and the Mermaid Inn certainly has its own tales. Read them below. The gist of which is this: mind your own business and no one will get hurt.